The International BoatBuilders’ Exhibition (IBEX) show provides an excellent opportunity to connect with the people and solutions advancing the marine industry. For Molex, we’ll be in booth 1158 at the Kentucky Exposition Center showcasing our wide range of rugged connectors, which provide reliable and safe solutions for everything from electrical power to industrial Ethernet. Our team will be there talking with guests about their extensive expertise in designing interconnect solutions that excel in harsh conditions including extreme vibration, fluctuating temperatures and salt water exposure. We’re also very excited to conduct a live demonstration of our Woodhead® Watertite® Wet-Location Wiring Solutions, the first system in the industry to allow for a totally integrated watertight safety system with robust enclosures, plugs, receptacles, cover plates and GFCI modules. Visitors to the booth will see firsthand how these products safely provide operational electrical power even when submerged in water. ML-XTTM Sealed Connection System: Rated IP68 and J2030 power-wash capable, the system features a one-piece plug housing and seal design which is permanently bonded using cutting-edge, two-shot LSR (liquid silicone rubber) molding technology. 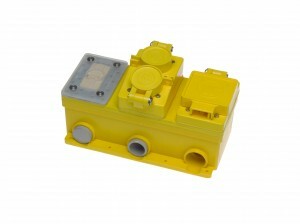 Woodhead Watertite Wet-Location Wiring Solutions: Molex has added three FD multiple outlet boxes with closure plugs and reducers to the product family. Constructed of rigid PVC, these outlet boxes are extremely durable and resistant to impact, chemicals and solvents. Mizu-P25TM Wire-to-Wire Connector System: At 2.50mm (.098”) pitch these connectors are the smallest to qualify to the IP67 standard and help boat builders implement wire-to-wire solutions in tight spaces while maintaining their integrity even when submersed in up to one meter of water. Brad® Industrial Ethernet Solutions: A rugged and complete Ethernet system with a variety of M12 D-coded, M12 Cat 6a X-coded and RJ-45 Ethernet products that exhibit superior resistance to water and high vibration. Sealed Industrial USB Solutions: The next-generation USB 3.0 panel-mount receptacles and overmolded cables deliver 5 Gbps data speeds, are IP67-rated and incorporate robust construction and protective features for harsh environments. We look forward to another successful and informative show and hope you’ll stop by and visit us in booth 1158.